Welcome to Silversands, one of the most luxurious resorts in Grenada. Perched peacefully overlooking the Caribbean Sea and Grand Anse beach in Grenada, you will discover the luxurious 3-Bedroom Hillside villa. 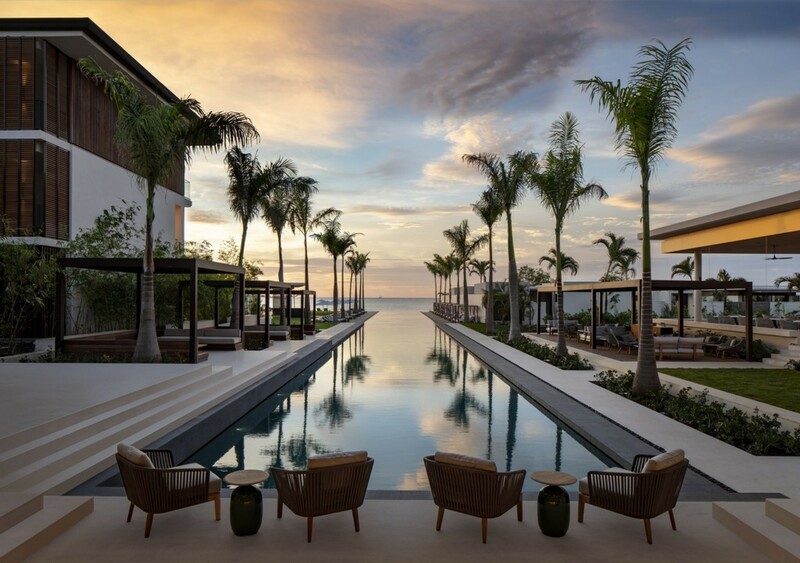 This newly built villa is part of the famous and sought-after Silversands Resort based in a serene tropical setting. The property can accommodate up to six guests across its lavish interiors and expansive exterior living space, expanding over a total of 1,450 Sq. meters. With a profusion of first-class amenities and friendly staff at hand 24/7, this is the perfect Caribbean getaway with seamless five-star luxury. Silversands is a brand-new luxury resort that is embedded on the Grand Anse beach. This beachfront location offers endless views across the crystallized Caribbean Sea. Wake up each morning to a view of endless blue hazes. The beach enjoys mild waters and soft breezes. Silversands location is perfect for a morning stroll as the water laps onto your toes, or an evening relaxing on the powdery sands as you stargaze. Staying in the beachfront villa caters to all your needs, while also allowing you full access to the resort’s amenities also. The resort features an iconic 100-meter pool that is one of the largest on the island. You can even unwind in the incredible stellar spa or dine in the hotel, tasting the tantalizing Caribbean cuisine that is hand-caught and locally sourced. The villas elevated position supplies you and your loved ones with both seclusion and startling drama. The surrounding garden nestles the villa into its own tropical landscape, bursting with vivacious greenery and tall swaying palms along the three spectacular hanging gardens. Laced in lavender, the breezes are tinged with refreshing floral scents. The three-tiered property was designed to spill over the hillside in an elegant and natural structure. Making your way into the elegant Hillside villa you will find the large double doors leading you into the hallway. The tiled floors and whitewashed walls create a relaxed ambiance instantly and open out into the main living area. This great room blends the living and dining area into one open plan room. The interiors are laced in handcrafted furniture and fitted with light colored oak floors and soft-tone stone. Light floods the room through the ceiling to floor windows and bounces around the room’s pristine walls and furniture. The great room indulges in panoramic views of the ocean and the pool deck. The room seamlessly transitions out onto the terrace through the ceiling to floor doors. The interiors also include a fully equipped kitchen, powder room, and service pantry. The kitchen comes fully equipped and ready to use and includes its own separate entrance. The terrace acts as the center stage of the villa. Walk out onto the large open terrace and watch the pale morning sunrise as you sip on a hot cup of coffee. You can slip into the refreshing silk-like waters of the turquoise, 61-square meter pool for a brisk swim or simply delve into the waters during the day when the sun is warm above you. The terrace is the perfect place to relax with your loved one as you lounge out on the sunbeds or dine alfresco under the covered patio. The pool laced with sun loungers along its edge, ideal for sunbathing. If it gets too warm you can pop up the large parasols to cast some soothing shade. Perch yourself in the covered seating area and enjoy the soft breeze that rustles through the tropical plants all around you. Read your favorite novel in total tranquility or simply unwind, soaking in the sea views. In the evenings you could always walk down to the soft sandy shore of Grand Anse beach, breathing in the fresh saltwater air. Watch the sunset as it melts like molten gold into the sea. You can return to the seclusion of your Hillside villa at any time, falling asleep to the distant whisper of the ocean. The Hillside Villa has a total of three luxurious master bedrooms. The bedrooms are each fitted with king-sized beds and include their own private en-suite bathroom. The first bedroom is based on the ground floor or garden level. This master bedroom indulges in its own private patio with an alfresco shower and a private plunge pool. The en-suite is fitted with a large bathtub, shower, and vanity. The second level master bedroom features its own private patio fitted with lounging chairs. The patio enjoys the elevated views over the Caribbean Sea perfectly. The room includes a lounge bed and high-resolution TV, and behind the bed is a desk and walk-in closet. The en-suite is incredibly spacious and includes a bathtub, shower, and dual vanity. The last Master bedroom encompasses the entire third level of the villa. The bedroom opens out onto a private balcony overlooking the pool terrace and the ocean. The balcony is fitted with a plush sofa and lounging chairs, a romantic setting to watch the reflection of the moon dance across the surface of the sea. The bedroom features a lounging bed, high-resolution TV, and desk area, though the walk-in closet you will find the private en-suite bathroom. The modern bathroom includes a bathtub, shower, and two single vanities. Bedroom 1: Master King-sized Bedroom, Private en-suite Bathroom, Large Bathtub, Shower, Two Single Vanities, Walk-in Closet, Desk, Access onto private Patio, Private Plunge Pool, Alfresco Shower, Garden Views, Panoramic Ocean Views. Bedroom 2: Master King-sized Bedroom, Private en-suite Bathroom, Large Bathtub, Shower, Two Single Vanities, Walk-in Closet, Lounge chairs, High-resolution TV, Desk, Access onto private Patio, Garden Views, Panoramic Ocean Views. Bedroom 3: Master King-sized Bedroom, Private en-suite Bathroom, Large Bathtub, Shower, Two Single Vanities, Walk-in Closet, Lounge chairs, High-resolution TV, Desk, Access onto private Balcony, Sunbeds, Sofa, Panoramic Ocean Views. The 3-Bedroom Hillside villa is located overlooking the Caribbean Sea and Grand Anse beach in Grenada. This newly built villa is part of the famous and sought-after Silversands Resort. Grenada is a vibrant Caribbean Island that encompasses the main island and a variety of smaller islands. The main island is laced in nutmeg plantations and so the location earns its nickname the ‘Spice Isle’. The island of Grenada offers a pure lifestyle and an authentic, relaxed vacation setting. This captivating island boast of silky beaches along the coast with sugar fine sand beaches, coral-fringed waters, and unobstructed landscapes. The island features a variety of water sports activities, such as sports fishing, scuba diving, and snorkeling. Explore these colorful coral reefs, spectacular shipwrecks, exhilarating drift dives, and a unique underwater sculpture park. Grenada has over 50 sites of intriguing underwater sites to delve into. There are also many exciting historical sites and nature spots for you to discover.